Whenever I check out the skincare section at Sephora, I notice that Murad is always heavily featured on the shelves but, up until this year, I had never tried any of their products. It was quite fortuitous then when the Canadian distributor of the brand ended up contacting me earlier this summer and asked if I'd be interested in reviewing some. For those of you not familiar with Murad, it is a skincare company founded by renowned dermatologist, Dr. Howard Murad. I am always interested in skincare backed by science so I was curious to see how the products would stack up against what I was currently using. My skin was also being super troublesome at the time, so I decided on some items from their blue Acne line even though I would not actually consider my skin acne-prone. The good news: my skin is now back to normal! But how did I feel about the products? Murad's products feature handy labels at the top of each tube to show what step you should be using it. Not that this is particularly difficult to figure out but I'm sure it's a feature some skincare newbies will appreciate. My Step 1 was the Clarifying Cleanser, a gel cleanser made with Encapsulated Salicylic Acid to fight breakouts. I liked this cleanser a lot. It feels very clinical (no fancy scent, basic clear gel), and it would be a good accompaniment to a Clarisonic if you have one. However, this is not the best for removing makeup and, in fact, I wouldn't recommend it for that. I accidentally got some in my eyes and it stung like crazy! Using a makeup remover before you cleanse with this is necessary. After using the Clarifying Cleanser, I would use the Skin Smoothing Polish a couple times a week. You'll notice this product is not from the blue Acne line but actually from the pink line which is for Combination Skin. The texture of this exfoliator is very fine (no giant and environmentally-harmful scrubbing beads here) and I liked it a lot. 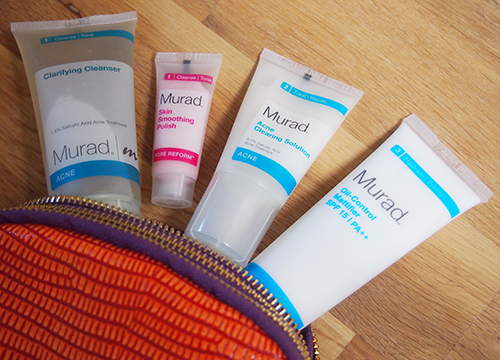 For any breakouts, Murad recommends the Acne Clearing Solution as a Step 2. Initially I thought this was a spot treatment but there is a different product for that. With this, the idea is that you spread it all over your skin, as opposed to targeted areas. This makes more sense for acne sufferers but if you are only dealing with an occasional breakout like I am, I probably would not recommend this. Step 3 was the product I was most excited to try: the Oil-Control Mattifier SPF 15 | PA++. Unlike the La Roche-Posay Effaclar Mat, this one contains SPF. Unfortunately, it was a huge disappointment. I found the formula really thick and uncomfortable, plus despite the fact that it's non-comedogenic, my pores felt really clogged and I swear it was the cause of additional breakouts. After all the work to clear them, this is obviously counter-productive so I had to stop using this moisturizer. Perhaps it was the SPF since I know that can sometimes be a problem for people with sensitive skin (which I don't have but I'm not sure how else to account for the weird reaction). gotta try! gosh so pretty! love this so much! Such a shame that not all of the products worked out for you. It is hard with skincare items because you invest so much into them....and they don't always deliver. I agree! While I love experimenting with new skincare, sometimes it just doesn't work out and I always return to what I know works best for my skin. Well now I feel I'm going to need to try it out! Thanks for the review!